Art has always been a passion for me, but due to personal circumstances I opted to leave school at 17 and pursue a career in travel, hoping to return to my vocation as an artist a little later in life. This took another 40 years and only now I have at last fulfilled my dream of becoming a self-taught, professional artist. 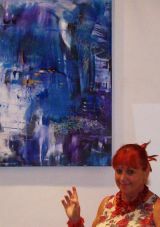 I have developed my style to interact with the observer as I like to keep a sense of mystery within my paintings, for the interpretation to change with each viewer’s own imagination. This way the painting will always be a source of creative visualisation, changing over time with the shifting thought processes. The synergies of these techniques combine to establish an intuitive, original and diverse portfolio. Copyright © Helen Margaret Kaminsky.